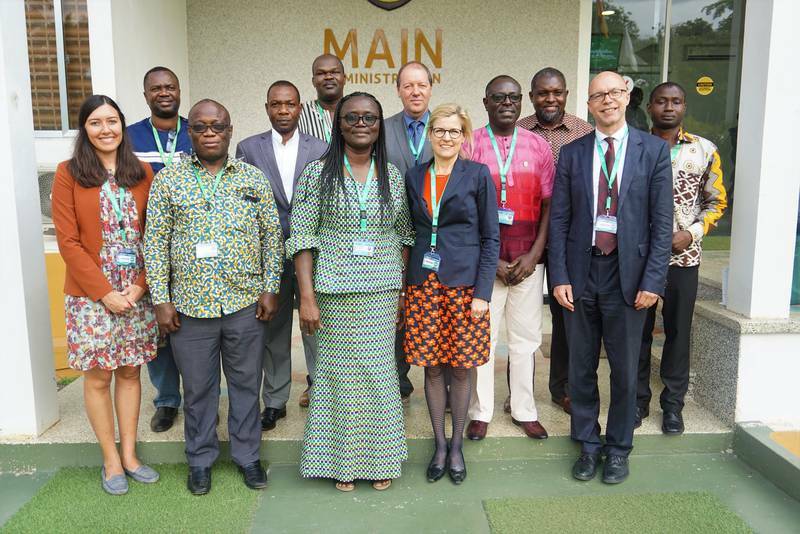 The Technical University of Munich (TUM) and Kwame Nkrumah University of Science and Technology (KNUST) in Ghana will become partners in innovation and sustainable development. The agreement institutionalizes and expands the previous collaboration between the two universities. The strategic partnership is an important part of the widely varied spectrum of TUM's involvement in Africa and launched last weekend by a delegation led by Prof. Juliane Winkelmann, TUM Vice President for International Alliances and Alumni, in Kumasi/ Ghana. KNUST is one of the leading universities of the African continent, connected with TUM through a many years of collaboration. For example, in the consortium ADLAND (Advancing collaborative research in responsible and smart land management in and for Africa) scientists are working on the conception and practical implementation of responsible and intelligent land management. Together with other partners, the two universities are also developing the electric utility vehicle "aCar", which will bring mobility to people in isolated rural regions of Africa, improving their access to health care, education facilities and commerce. And the two university hospitals – university hospital TUM Klinikum rechts der Isar and the Komfo Anokye Teaching Hospital – are linked in a partnership to improve processes and educate specialized local personnel. "Today we are already forming several successful technology and education initiatives together with KNUST," says Prof. Juliane Winkelmann, TUM Vice President - International Alliances and Alumni. "We look forward to continuing to press these issues in the future and to jointly educate young people who will move industrial and socio-economic development forwards with technical innovations and bold entrepreneurial spirit." Working on the foundation of their collaboration to date, the two universities will launch direct measures as well as long-term processes in the future-oriented areas of water and energy research, secure nutrition supplies, environment, mobility, global health and governance. The first strategic partnership on the African continent with the specific goal of sustainable development is an important part of the broadly deployed efforts of TUM on behalf of Africa. An overview of these measures will be presented during the symposium "Sustainable Development in Africa" at the TUM Garching campus on November 16. Professors from TUM will present various projects in the fields of health, resources, automotive technologies, architecture and renewable energy systems. The keynote speaker will be the architect Prof. Francis Kéré, born in Burkina Faso and holder of the TUM Chair for Architectural Design and Participation since 2017. Prof. Francis Kéré is regarded as one of the most important representatives of socially responsible architecture.